It is important that you know how to correctly cut your rabbits nails as if it is done incorrectly, you can cause them to bleed which could easily get infected. In this post, I am going to give you some tips on how to cut your rabbits toenails so they don't become overgrown. First of all, you want to make them used to their feet being touched. To do this, when you are giving them a carrot or some other food which they can have, you want to go next to them and carefully pick up their paws and hold them up gently so they become used to you doing so and aren't as afraid when you actually go to clip them. After this, you will want to make sure you know where you should and shouldn't cut their nails. The part in which you don't want to cut is called the quick. This is the pinky looking part. The reason you don't want to cut this is because it will bleed if you do and there is a vein there, along with nerve endings, which makes it hurt your bunny. By lying them on their back, it can be very useful as it tends to relax them, yet this is difficult to do with some bunnies. I would try this method in the video first of all. Another way you can cut your rabbits nails is by having two people. One person will be holding them and the other will have the clippers and will hold each of their paws and clip them. Either way works well it just depends which one is easier for you. If you don't feel comfortable clipping them yourself, at your local vets they should be able to do it for you. I hope this short post on how to cut your rabbits nails was useful for you, making your bunny have nicely cut nails! Cheek teeth problems in rabbits happen from elongation occurring which is when normal wear doesn't properly occur. This could be due to the teeth not aligning properly. This generally happens in middle-aged and older bunnies. 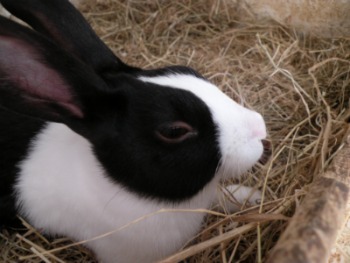 Yet the younger bunnies are more likely to suffer something called congenital malocclusion. The breeds who are at higher risk to suffer from congenital misalignment are dwarf and lops. This tends to mainly be from ageing bunnies, due to the fact their teeth are always growing and they are living longer than the bunnies in the wild. This can occur from lack of fibrous, tough foods, as these allow them to properly grind their food. How it is treated, depends on how severe it is. An option is to have something called coronal reduction and in this they have their teeth trimmed down. Sometimes, extraction is necessary. They may be prescribed some different medications in which you will need to give to them. Make sure you go to the vets though to have them checked up to see what should be done. Rabbit uterus cancer is also known as uterine adenocarcinoma. This is the most common form in which rabbits get cancer. It occurs in above 60% of bunnies over the age of 3. This usually forms after a bunny has already developed some other reproductive issue in them. This could be endometriosis. The symptoms can vary between the bunnies. If your bunny is still capable or reproducing (hasn't been spayed) then they are at risk. This could involve a hysterectomy to remove the whole of your bunnies uterus. This is what they would consider to do first if it hasn't spread beyond their reproductive organs. They may preform a biopsy to see how much it has spread. In this post I am going to talk to you about the positives and negatives about why rabbits are good pets. They are good for people who want a small friendly pet. They are quiet and ideal for condo's or apartments (make sure you are fully committed to looking after them though. On average they live 4-7 years yet it will depend on how well you care for them as some can live for up to 18 years. They don't bark, the only noise they make is a high pitched squeal when they are frightened or hurt. They usually don't mind being petted or groomed. They will take food out of your hand, especially as you bond and become closer to them. They can be a full indoor pet as long as their cage is large enough. You can take them outdoors and but them a leash to do so. They sleep with their eyes open sometimes. They may hurt themselves chewing a wire or your furniture if thy are indoors, due to the fact they like to nibble things. Like all pets they may bite you. They need to keep their claws clipped. They need to be brushed regularly. They can hurt you if they are on your lap and jump off and kick you. They can sometimes have aggressive behaviour. Personally, I find rabbits are good pets and would recommend you to have one if you are able to and have the space too keep them. Make sure you but them a good sized hutch and to keep them with lots of toys to play with. I hope you now understand why rabbits are good pets. As you may have experienced, a bored bunny is a bad bunny, so it is important to know how to entertain your rabbit. This is because as you may not already know, they are actually very intelligent, so you need to make sure that they have lots of things they can do, even when you aren't there. You may need to purchase some toys to 'work their brains' or even something fun for them. This species requires more attention then you may have not known. You have to make sure that you rotate around their toys as well so they aren't sitting with the same toys all day. They absolutely love to chew, so you have to make sure that they aren't left near anything they can wreck. They love to throw things around, some even enjoy to attack things. You can purchase some small toys in which may have a bell in them and are small little balls, or something which they can chew as well. As they love to chew, make sure they have something available in which you don't mind them chewing as their teeth are surprisingly really strong. This is also good as they need to keep their teeth worn down as their teeth are constantly growing. To give your bunny something to 'remodel' you can use cardboard boxes. All you need to do is cut holes out of each of them and stick them together and allow them to chew it and run through it all they want. This is said to save your furniture. You can use various objects and encourage them to jump over them and to go through them. Anything which makes them have to do something different, other than hopping around. Grooming a long haired rabbit may be very hard to do if you are unsure of how to do it. Below, I will list some ways and useful tips in which I would recommend you to use. Their fur can make them look absolutely adorable, yet it will require daily grooming in order to keep it all looking nice. Your bunny will normally shed a few times a year, although some do shed all year round. If your bunnies fur becomes matted in places, over time it can become a large problem. They will become large clumps of fur which in some cases can make their movement be restricted. If they are groomed properly, it can take up to around half an hour each day. Personally, when choosing a bunny, I would choose a short haired one, such as the one I currently own. You may want to invest in a pair of clippers so you can keep their fur nicely trimmed down and looking very well kept. They are a safe way of removing clumps out of your bunnies fur. If your having trouble with clippers, you could try a pair of electric ones. These are said to work quite well. You may want to use a comb in your rabbits fur as well. You can even use a human one as they will pick up any small matts to save you some trouble later on. Just make sure not to pull their fur too hard as it will cause them pain. If they are completely covered in a ball of fur, like one giant tangle (which can occur within weeks) then I would recommend you going tot the vets to have this sorted out so it doesn't become a larger issue. Keep in mind, you may not want to go to the vets regularly due to it being fairly expensive to have this done, so you are going to have to stay on top of it your self. I hope this post helped you to gain a better understanding about grooming a long haired rabbit. Do rabbits need baths is a very common question in which people ask. They are different to dogs, as you do need to bath your dog regularly. They only need bath if they are in a really bad condition in which for some reason they need to be cleaned up, yet this has to be done a certain way so make sure someone who knows what they ar e doing, is doing it. They are absolutely terrified of water and I am not surprised by this as when they are in the wild, if in their burrow it gets flooded with water, it means they are going to die. This is an instinctual feature in which they have. When you try to bath them, they will automatically panik, which makes it very difficult to actually wash them. Short haired bunnies tend to be okay (this is breeds such as dutch) although long haired bunnies (such as lion head) can end up with parts of their fur matted and tangled, even sometimes sticky. If this was to happen, then you should first of all try to do what is called a 'dry bath'. This is were you take baby cornstarch and put it onto the parts of your bunnies fur which needs cleaning. You then massage it into these areas which should help all of the dirt to them slide off of the fur and be removed from your bunnies. Also, in pet shops, you can now purchase wipes in which you can do the same with. I have never used these before, yet they look like they would be good for long haired bunnies. If you do need to bath them for some reason, you may want to consider asking a vet for assistance, as they will know how to do this. It is a good idea to avoid giving your rabbit a bath as they will absolutely hate it. Want The Best Rabbit Advice?